(Agua Dulce, Calif.): One of the "fuels" behind the what has often been described as the "Happiest Race on Earth," is the hospitality and camaraderie found after each day's competition and at the various pre and post-event celebrations. With that in mind, is it that surprising that a Baja, Mexico based-rally like the General Tire NORRA Mexican 1000 has an "Official Tequila?" On the eve of the largest Mexican 1000 since its rebirth in 2010, Azuñia Tequila and NORRA are proud to announce the continuation of a partnership that truly exemplifies Azuñia's corporate mantra of "Celebrating the Adventures of Life." Not only will NORRA racers and their teams enjoy the world-class taste of Azuñia Tequila and Azuñia margaritas all the way down the Baja peninsula, but Azuñia will once again honor participants via the Azuñia Tequila "Spirit of NORRA" Awards. 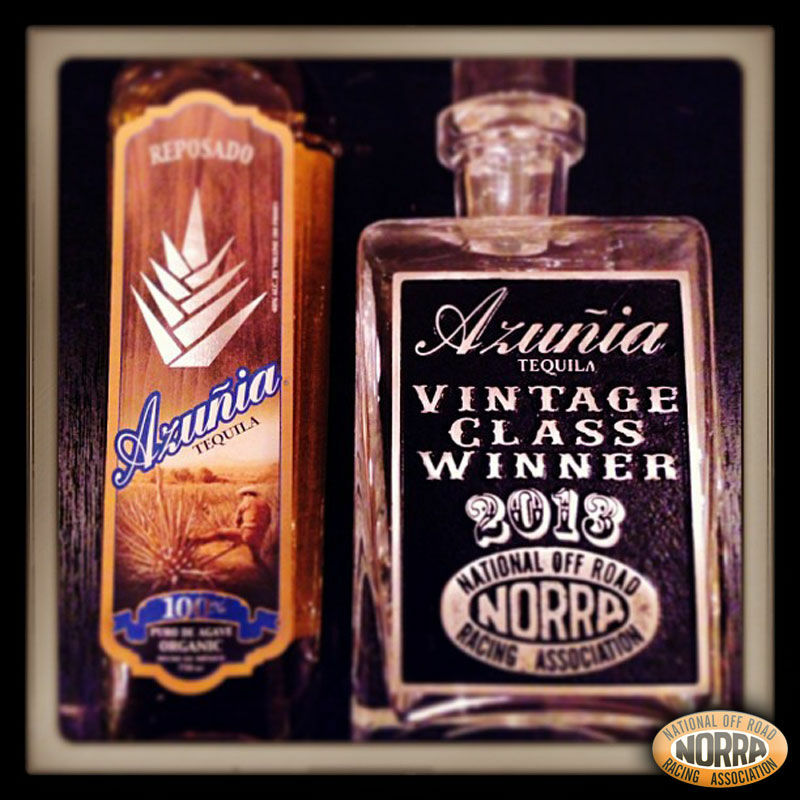 The 2013 NORRA Mexican 1000 saw the debut of these handcrafted Azuñia Tequila "Spirit of NORRA" Awards. Returning for 2014, they will be presented to the motorcycle, truck, buggy and sedan teams that best reflect the special retro vibe that is the annual NORRA Mexican 1000. The “Azuñia Tequila Spirit of NORRA” will once again be divided into four distinctive categories for race/rally vehicles dating back from 1994 with awards going to historic bikes,buggies,trucks, and sedans. Candidates will be judged during the General Tire Vintage Round-Up and Bilstein Tech Inspection taking place on Saturday, May 9th in downtown Ensenada, Baja, Mexico. However, all candidates must finish every mile of this year's 1,300-plus mile Mexican 1000 to qualify for the special Azuñia awards, which will be announced at the rally’s huge seaside South Point Hotel Casino "Driver's Awards" after the event's conclusion in San Jose Del Cabo. The "Azuñia Tequila Spirit of NORRA" trophies are in addition to the now famous brass competition trophies awarded by event organizers (which are open to all types and ages of vehicles) that were hand-sculpted by NORRA President Mike Pearlman. Recently BILSTEIN Shock Absorbers has also added two of their legendary "Madonna" awards for racing excellence to this year's rally. Azuñia Tequila's presence at the NORRA Mexican 1000 is far larger than just great product and beautiful awards. Like it did in 2013, Azuñia will support two of the event's most popular cars -- the orange 1955 "Rippin' Rooster" Chevy (left) and the 1971 "Snortin' Nortin" Chevy Nova. Azuñia Tequila Founder and President Jim Riley (top right) enjoys some pre-rally time with General Tire's Lisa Wood before the start of last year's NORRA Mexican 1000. Riley's ride of choice is the Azuñia-powered "Snortin' Nortin" Chevy Nova. Beginning in 2010, the National Off Road Racing Association (NORRA) began promoting a rebirth of the NORRA Mexican 1000 rally. Dubbed the “Happiest Race on Earth,” the unique off-road rally was co-created by promoter Mike Pearlman to consist of special stages (unlimited speed timed stages in the dirt) linked together by controlled speed liaison / transit sections (highway). The one-of-a-kind, once-a-year, four-day rally includes vintage off-road vehicles and motorcycles, rally cars, a limited group of modern desert racecars and classes for prerunner trucks and buggies. Pearlman’s late father Ed and others established the first running of the NORRA Mexican 1000 off-road rally in November of 1967, which eventually became internationally recognized and evolved into the Baja 1000 in the mid-1970s. 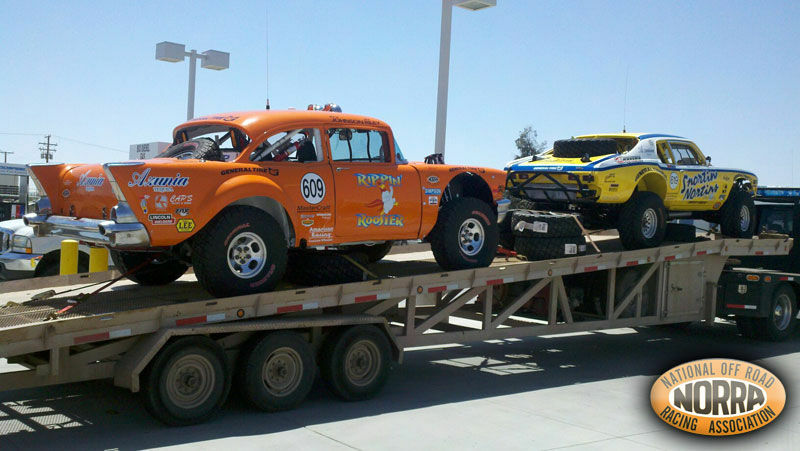 In 2013 NORRA added a second event to its calendar -- the new NORRA Mexican 500. 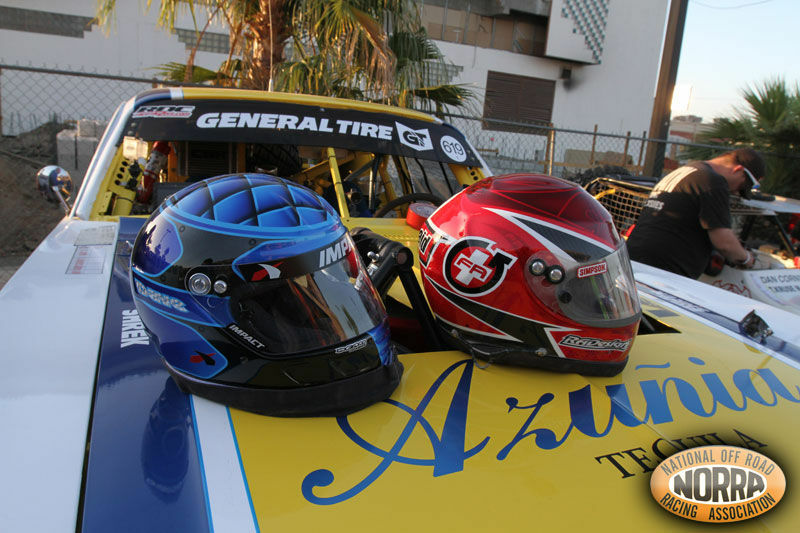 The General Tire NORRA Mexican 1000 is proudly supported by General Tire, American Racing Wheel, South Point Hotel Casino, Walker Evans Racing, Azuñia Tequila, KC HiLites, Bilstein Shock Absorbers and Mastercraft/Impact Safety.